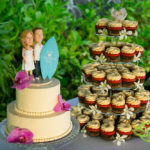 Bob Brown, a Kona Hawaii wedding photographer, photographed this summer wedding on the Big Island of Hawaii. 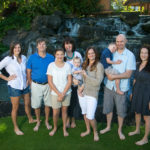 This couple was married at a private home on Alii Drive in the heart of Kailua Kona, Hawaii. The house is called Hale Pua House and is located on the ocean side of Alii Drive. 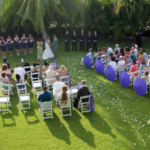 It was a beautiful ocean view and a lovely lawn for a wedding or an event. After the ceremony the family and guests all got in a bus and headed to Old Airport Beach Park for photos and the then headed off for the reception at the Blue Dragon. The blue dragon has live music and a great outdoor area so that you can be separate from the rest of the guests at the restaurant. 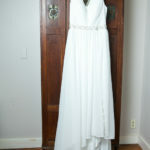 The couple had their wedding coordinated by Bliss and Bloom. They also did all the flowers for the wedding and for the reception.